People behave in ways that make sense to them and are consistent with their own understanding and views of the world. Offenders are no different, and personal construct theory and techniques offer the clinician and therapist a powerful framework for understanding an individual s view of the world, which has practical implications for assessment and treatment. Julia Houston has many years experience of using Personal Construct Psychology (PCP) in offender rehabilitation. Her book is aimed at clinical and forensic psychologists, psychiatrists and nurses, and probation officers and social workers, who work with offenders in secure or community settings. For those unfamiliar with PCP this book provides a concise introduction to the concepts, and methods (principally the use of repertory grids), which would be useful in many clinical and therapeutic settings. But the unique feature of the book is the focus on offender assessment and treatment, showing how PCP relates to offending behaviour and offenders, and demonstrating how PCP is used with a variety of offender types. There are specialised chapters on young offenders, violent offenders, sexual offenders, personality disordered offenders, mentally ill offenders and those with problems of alcohol or drug abuse. 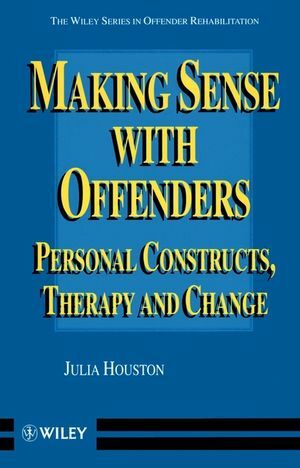 Julia Houston is the author of Making Sense with Offenders: Personal Constructs, Therapy and Change, published by Wiley. THE THEORY AND PRACTICE OF PERSONAL CONSTRUCT PSYCHOLOGY. Personal Construct Psychology and Offending. Therapy with Offenders--The PCP Perspective. Repertory Grids and the Measurement of Change. CLINICAL APPLICATIONS OF PERSONAL CONSTRUCT PSYCHOLOGY WITHOFFENDERS.